A postcard for the Hershey Tournament and the Penn State 8v8 arrived earlier this week. It got my attention, not only because the two events are TourneyCentral.com tournaments, but because it was well designed and executed. Here’s why. I didn’t have to open a letter or fight with that low-grade postage wafer that tears most of the information off the top of the flyer folded in thirds. “2 great tournaments.” The logos were right there on top, leading the description. Who, What, When, Where, Why and How were listed in bullets points and were easy to read. No disclaimers were mixed in to “CYA” the tournament. Just the facts and where to go to get more. The web address was right there as was the email AND PHONE NUMBER. Chances are most folks will go to the web site first, but there are a few coaches left who still feel more comfortable picking up the phone and getting a feel for how real the event is. The designer did not stuff every square inch of postcard space with crap. Get the basics out, push your audience to the web site where they can read more if they need to. Just the facts and lots of breathing room. – A human face, a soccer player or coach. A family that has been helped by the charity. – Rule of thirds and some offset. The tournament panels being side-by-side instead of flanking the middle content. 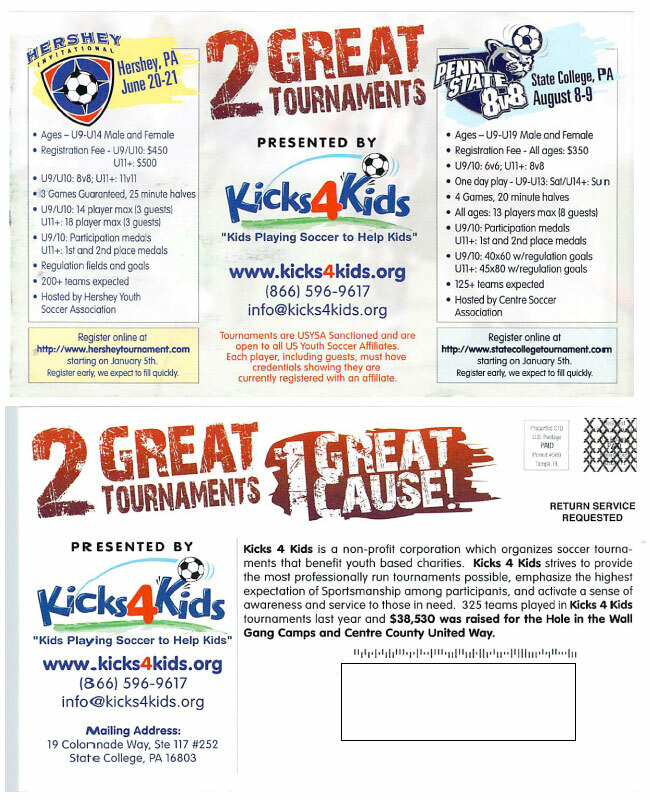 – A little more contrast between the actual soccer tournament events and the Kicks4Kids organization. – More WIIFM (What’s in it for me) to the coach and less about the hosting organization. Please feel free to leave a comment if you disagree with my list. Print and direct mail is not dead. Neither is the US Postal Service. 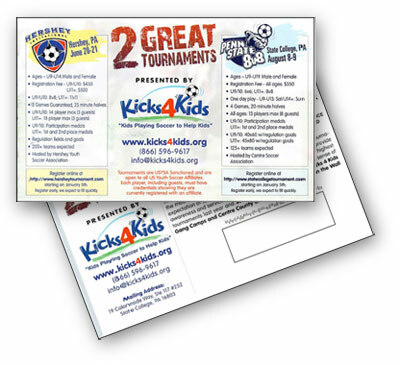 A great soccer tournament will use a mix of email marketing, print and word-of-mouth to get the message out about their tournament. Just in case you were following along with us, checking off the dates until the big NSCAA soccer conference in St. Louis, here is our booth status. Almost ready! 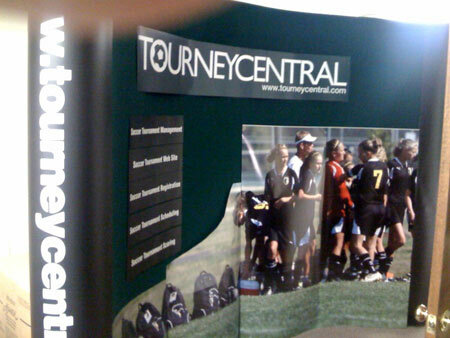 Our TourneyCentral.com NSCAA booth. A little more nip and tuck, but we're almost there. Meet us in St. Louis for the NSCAA. We’re in booth 1735 and we won’t even try to sell you anything, so you can stay and chat as long as you want. Really. And, if you want to make a podcast promoting your soccer tournament, Back of the Net will help you with that. You don’t even need to be a TourneyCentral tournament.